[We have all had discussions about sourcing this and that on our Morgans from time to time. Sources and prices of needed bits are a common topic when we get together. And I get it. It’s simply human nature to look for a good deal or the best price. And, considering the UK exchange rates adds another dimension to our searches. However, as is so aptly highlighted in the article below, price is not the only factor we must consider. There’s been a lot of talk in our world lately about the death of the speed shop. Even Leno has discussed it. The speed shops of yore, places where you could pick up a good ¾ race cam, a Sun tach and some of those yellow Lakewood traction bars, have more or less disappeared from the American landscape. Brian Hernan, the owner of the shop, saw the ad, called me up, and invited me in for an interview. I started work the Monday after graduation–first in the warehouse, but eventually graduating to a desk on the sales floor. This was pre-internet. Our retail beat centered on the local SCCA scene, but our wholesale accounts stretched far. Here’s the really cool thing: We catered to the sports car world. If it improved an MGB, 240Z or VW Rabbit, then we sold it. And in many cases, we actually stocked the part right there in our warehouse-rows of pallet racks containing all of the day’s top performance brands, like Hella, Cibié, Weber, Momo, Nardi, Kamei, Zender, Koni, Ansa, Amco and K&N. You wanted a roll bar for your MGB? We had one in stock. Needed a front spoiler for your 240Z? Should I pull a urethane, fiberglass or ABS plastic one? Fiberglass hood for a 5.0 Mustang? We stocked ones made to our own design. Weber tuning questions? Let me get Brian and he’ll help. We stocked jets, parts and pieces for both down-and side-draft models. Plus we had the Pat Braden and John Passini Weber tuning books right on the shelf. I left there 22 years ago to join the GRM family. Automod never made the jump to the internet, and I’m pretty sure they’re gone now. I want to slightly change gears, but don’t worry. This will all tie together shortly. Whenever I’m on the road, I try to visit some local guitar shops. In reality, any piece of guitar hardware, either new or used, it just a few keystrokes away. But there’s something magical about hunting for it in person, and I have been lucky to visit killer guitar shops all across the country: Nashville to Austin, New York to St. Louis, and Las Vegas to San Jose. During a recent trip to New York-my annual winter pilgrimage to see family and grab a nosh while taking advantage of the seasonally low hotel rates–I hopped a train to Brooklyn. My destination was a place called Main Drag Music. I found them on the Googles, and it was one of the half-dozen shops I visited during those few days in my urban paradise. Going to these different places also forces me to see different parts of a city. You never know what you’ll come across, right? Anyway, while in Brooklyn I found a pretty big independent music store, especially by New York City standards. The dude who worked there saw me eyeing a bass. “Try it,” he insisted. So I did. No pressure. No hard sale. Then he saw me looking at the effects pedals, those magical little stomp boxes that can make you sound like Eddie Van Halen, Jimi Hendrix or Stevie Ray Vaughan–okay, not exactly, but you know what I mean. “Looking for something in particular?” he asked. Then he ushered me to a soundproof practice room and brought me a ’78 Fender Precision Bass. Half an hour later, I put down the guitar. Closing time was approaching, and I figured it was best to not get locked inside the store. While such a situation could lead to the ultimate jam session, as best I could tell the store did not contain a Chinese restaurant. “How’d you like the pedal?” was all he asked. The price was close to $250. I figured that I could probably find it online for less. In my book, that’s a lot of money for an effects pedal–like, a lot. But, at least in my mind, I did the right thing: I handed him my credit card. He gave me info, and the store invested in the inventory–never mind the rent and other brick-and-mortar expenses. He let me try it out to my heart’s content. He made the sale. Fast-forward to today, and I’m still in love with that piece of equipment. It would have taken me several other purchases, I figure, to find this tone. In the end, his advice and knowledge saved me time and money. We’re all looking to save a buck, and I fully realize that ordering things online is easier. You can summon nearly anything to your door in a day or so, from a new bicycle to a 48-roll pack of toilet paper, by barely moving a muscle. But when someone makes an investment in our scene, I give them the nod. If we don’t return the favor, then I’m going to run out of places to stop while visiting Brooklyn. 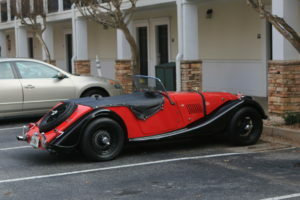 The Morgan Plus 4 has been around since 1950, and on the surface not a lot has changed. The body is still rich in curves and chrome, the front wings still span two thirds of the car’s length, the wheels are still spoked and the roof still comes down via manpower rather than electricity. But don’t let that fool you into thinking the Morgan Plus 4 is a relic. It’s not, as I set out to prove by liberating one from the factory for an all too brief three-day fling. During my time as a motoring writer, I’ve been lucky enough to drive everything that Morgan has to offer. I’ve enjoyed the cheek and charm of the 4/4 – the Plus 4’s little brother. I’ve covered many a happy mile in the Plus 4’s big brother, the 3.7 V6 Roadster. I’ve giggled like a fool while piloting the modern 3 Wheeler, and I’ve used far too much fuel listening to the V8 soundtrack that accompanies the Morgan Aero cars. But out of them all, it’s the Plus 4 that has won my heart. If I’m ever in the fortunate position to be able to afford a Morgan, this is the one. The 4/4 is charming, but the 1.6-liter petrol engine is hardly a thrill. The 3 Wheeler I adore, but it’s a fair weather car, and sometimes in the UK that means a “two days out of the year” car. The Roadster with its 3.7 V6 is too wild for me, too “on” all the time, if you will. As for the V8 cars, I love them, but they just don’t have the draw of the traditional steel chassis Morgans, at least not for me. The Plus 4 is pretty much perfect in my eyes. It has an eager-to-please personality that the others miss in the pursuit of trying to be too much of one thing or another. In a nutshell, it’s the perfect all-rounder. At least in the context of a two-seater, open-top sports car, that is. The Plus 4 came about because the 4-4 (that’s not a typo, it later became the 4/4) wasn’t satisfying those buyers looking for a bit more pace. This was still well before the days of the Plus 8 with its thumping eight-cylinder, and the V6 Roadster wasn’t even a twinkle in Peter Morgan’s eye at the time either. The 4-4 was Morgan’s main offering then, so if it didn’t please a customer, there was nothing else to sell them. They would go and buy from another brand. To address matters, Morgan put a 2,088cc four-cylinder engine from a Standard Vanguard into a slightly longer 4-4 chassis and offered that to the purchasing public. It worked to retain those strayed to other sports cars options, and ever since then, the Plus 4 has been a mainstay of the Morgan range. Over the years it has seen many engines in its bay, but it’s always been a 2.0 (or thereabouts), and it has always stood its ground as a staple in the lineup as the 4/4’s bigger sibling. This, the most modern version, is powered by a 1,999cc Ford GDI engine mated to a five-speed manual sourced from Mazda. It boasts all the modern niceties you’d want like twin cams and fuel injection, and the unit is good for 154bhp at 6,000rpm. As for torque, you’ve got 148lb/ft. I know, those two numbers don’t look too astonishing on paper. It’s the inclusion of a third that brings the fun: the weight. And the Plus 4 tips the scales at just 2,044lb. That makes things much more interesting. And while it may indeed have a modern source of propulsion, there is nothing modern about the way it drives. But that’s not a bad thing—no one buys a Morgan to ride on the cutting edge. In our fly-by-wire world, it’s nice to have a heavy clutch and a firm brake pedal. The steering may be assisted, but you wouldn’t necessarily know it. It’s heavy, in the way that results in feedback and a more direct connection to how the car’s interacting with the road. You have to drive this car and feel every tiny mistake you make along the way—it won’t hide things from you with trick adaptive suspension or swaddling comfort. It’s not easy to drive the Morgan fast like it is in so many modern assisted sports cars, but if you commit to it, if you work through it, it is oh so very rewarding to get it on the edge. The engine hauls the Plus 4 along with impressive urgency for such a small naturally aspirated lump, and its an eager little thing throughout the range. Were it not for the factory-fitted Yokohama rubber, oversteer might be an issue even. It’s not though, at least on the right rubber, and grip is plentiful here. In fact, hit the gas too hard off the line and your spine is thanked with a punch from the tramping rear axle you’re essentially perched on top of. 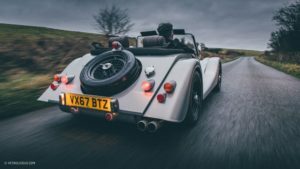 The Morgan Plus 4 is a car that demands your respect and expects you to learn. If you just get in and try to drive it like you would any other sports car, you probably won’t enjoy it. You may even find it hard and unrewarding work. Bond with it though, give it some miles and some time spent getting used to the chassis, and I bet you’ll fall for it. The cockpit while relatively spartan, is finished in beautiful, comfortable leather, and the detail in the fitting and stitching is astounding. The Moto Lita steering wheel is tactile and inviting. You want both hands on it at all times. The gear shift is slick and mechanical, direct and sure. You notice changing gears with this setup, rather than losing the action to autopilot as you would in another car. Then there’s the bunched up, race-style pedal box with floor-mounted hinges. It reminds you from the first stab of the clutch on startup that you’re not driving the normal or the mundane today. It’s not inconveniently sporty to ride in though, and it’s quite comfortable; with the roof up for instance, I still fit inside easily, which being 6’3” isn’t always the case. There’s even a trick, modern stereo, but fear not, no infotainment iPads to be found here. 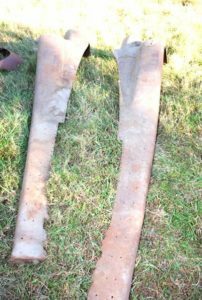 1954 Twin Spare, High Cowl For Sale !! This is a great ‘barn find’ project for someone looking for their next adventure. 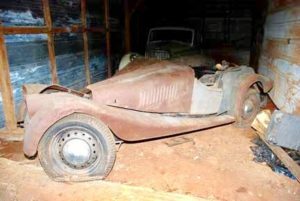 This 1954 Twin spare, high cowl project car is available in Georgia. It will require a ground up restoration. Contact SuperDave Bondon at for more details. 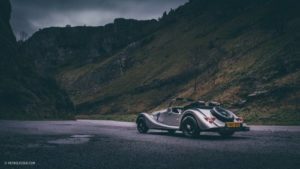 Morgan Motor Company has partnered with Frazer-Nash Energy Systems to develop the British manufacturer’s first electric production sports car – the Morgan EV3. 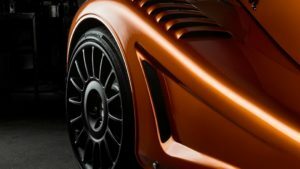 Set to enter production next year, the three-wheeled EV3 will combine the classic, coach-built styling that Morgan has become renowned for with an all-new architecture that incorporates proven electric vehicle technology. The EV3 will benefit from rapid-charge capability, a lower centre of gravity and improved acceleration. A liquid-cooled 34.8kW motor is driven by a 21kWh lithium battery and will send power to the rear wheel. Morgan claims the EV3 will be able to travel 120 miles on a single charge. 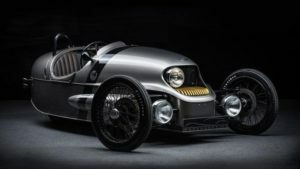 The new three-wheeler is certainly a head-turning piece of design, with the British manufacturer claiming that its looks were inspired by “1930s Aero-engine race cars, classic motorcycles and 1950s fantasy automatons”. Steve Morris, managing director of Morgan Motor Company, said: “We are delighted to announce our technical partnership with Frazer-Nash Energy Systems as we enter this exciting phase of EV3 production. “We have been working closely on optimising the EV3’s architecture in every way to develop a car which will offer proven reliability range and cooling performance, combined with the pure driving experience that is expected of every hand-crafted Morgan. “The greatest challenge lies within introducing EV technology into our factory workflows, customer experience and dealer network in a robust and most importantly safe manner. Noamaan Siddiqi, business development director for Frazer-Nash Energy Systems, said: “The EV3 plays an important role in Morgan’s future strategy. Achieving zero emissions using electrification is a requirement no manufacturer can afford to ignore. 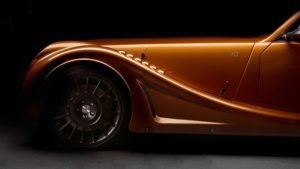 “Morgan has always embraced the latest technology within its vehicles to ensure it can continue to build relevant hand-crafted British sports cars. “At Frazer-Nash Energy Systems, we appreciate the heritage and craft that Morgan brings to the world of EV technology and we in turn will bring decades of EV expertise to ensure that EV3 customers will receive a car that is reliable, proven and exhilarating to drive – a thoroughbred Morgan. No word has been given on price, but Morgan has confirmed the EV3 will enter production in the third quarter of 2018. Trevor and Andy peered between the two houses. Sure enough as advised there was a shed down the driveway. ‘D’you think this is the house` asked Trev. Andy replied that the address was right and if the rumors were correct the Morgan should be in that shed. They approached the front door and rang the bell. A pleasant lady answered the door and smiled. 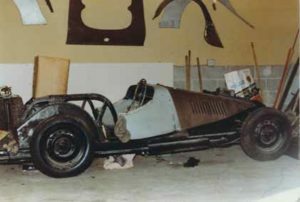 Trevor introduced himself and explained that he and his friend were following up a story that an old three-wheeler was in her shed. “Oh that old thing” she smiled and asked them to come in. She was Margaret and explained whilst making tea that that the Morgan was her late husband’s. The two friends admired the photographs on the sitting room wall several of which showed a smiling couple, one whom was clearly Margaret some years ago, in front a smart Super Sports. Margaret appeared with tea and cakes which they gratefully accepted and sat smiling at each other. At length Trevor asked what had become of the old car. Margaret explained that it was still in its garage at the bottom of the garden. They were both excited when she offered to show them. With much trepidation they followed her down the garden. Margaret explained that as her dear late husband had died two days before Christmas some eight years ago the garage was not used. There in the gloom stood the Morgan, very sad in its dirt and cobwebs. Andy spotted a small urn on the seat, he looked at Margaret who explained and said Yes, it’s Tom. He always went for a drive on Christmas day so I put him there and left him in peace. She wiped a tear from her eye and the two men thought it wise to return to the house. Over more tea she said that she thought he had been there long enough and in answer to their question agreed that it might be nice if the old car could again give someone some pleasure. After negotiating a price, Tom was placed on the shelf by some pictures of his car which was then loaded on to the trailer. They left promising to keep in touch and to show Margaret the restored result. A year passed and as most of the work apart from the new paint job had been cosmetic the time came to test drive. This all went well and the two pals agreed it had been a worthwhile operation; so it was decided that as Christmas was but two days away they would again visit Margaret and show her the restored car. The next morning being cold but dry. Trev opened the garage and to his horror the Mog had gone. Andy was called and in short order the police. Evidence was sought, locks and keys were examined but there was nothing to indicate what had happened. Photographs were asked for but as they had planned a finished photo shoot there was little other than progress pictures. Andy remembered that in the old garage was a series of pictures of the complete car, so it was decided that these would be better than nothing. The two friends despondently made their way to Margaret’s and over tea and mince pies told the sorry tale. She was as upset as they and agreed to them taking the photographs. They trooped down the garden and opened the shed door. The three of them stood open mouthed, for there covered in cobwebs with its old faded paintwork sat the Mog. The 2017 MOGSouth Holiday Party was held in Athens, Georgia while it was empty! The entire town was away, in Atlanta, for the big Georgia – Auburn football game. It was nice to have the town to ourselves! And, we made the most of it! We had 4 Morgans, a 4/4, a Plus 4, a Plus 8 and an Aeromax. Well represented I would have to say, as Morgans are not all that common at our Holiday Parties. The weather was fine, not hot and sunny but mild, mid 60s and, for the most part, dry. Much better than the biting cold of the north. The cold is hard for us Florida types. We never have the right clothes, etc. This year we arrived at the hotel around dinner time on Friday. We were parched and looking for something to eat. We opted for the Foundry, the hotel’s captive dining spot. It was also the music stage and concert hall so we had entertainment while we ate. Actually we had three musical groups. The first was merely a guitar and singer. The guitar was better than the singer. The second group was a bit of a country rock sort of band. Loud but reasonable (at least to my taste). The third, almost a blue grass band, had the best singer of the bunch. Perhaps they just got better as the beer took hold . . . Once we had eaten, we found a large contingent of the MOGSouth revelers in the bar. Back from wherever and as is the norm for MOGSouth . . . tales were told. All good stuff. We made the trek to the Holiday Party via car this time. Athens is almost impossible to get to by air. Certainly for us coming up from Florida. We normally fly but we just couldn’t make that work this time. Too many things to fight. Took too long, cost too much, too much hassle, required the big airport (not one of the smaller regional airports), etc. Ian and Barbara Shelmerdine traveled with us, and they concurred. We chose to come up from Florida through Macon, GA and visit the US Air Force’s Museum of Aviation at Warner Robins Air Force Base. I had worked in Marietta, GA for years. Marietta, GA is just north of Atlanta and is where Lockheed Martin builds the C-130 Hercules cargo airplane. 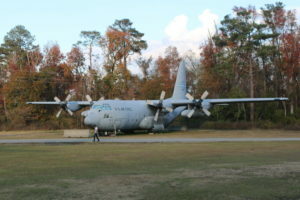 Warner Robins Air Force Base is where the US Air Force’s C-130 Hercules headquarters is located. 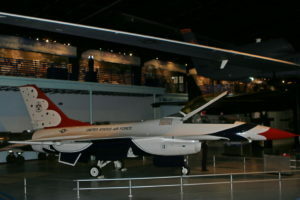 So my job necessitated quite a few business trips to Warner Robins Air Force Base, but I never stopped however to visit the museum. Too busy, no time . . . you know the drill. So now that I am retired and live out of state, I decide to go. I guess I’m a bit slow. Well, at least that’s what Andrea says. It was great! 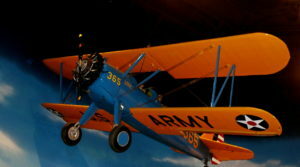 Lots of wonderful planes and well thought out vignettes. We certainly didn’t have enough time to see it all. They had several buildings with hundreds of displays. I only worry about the planes displayed outside. The weather must take its toll? Regardless, I will have to come back. What we did see was quite impressive from the very large and very well known to the smaller and lesser known aircraft. A building was dedicated to World War II and another for Viet Nam, while other displays highlighted more modern aircraft. A recommended stop should you venture nearby. The MOGSouth Holiday party was held at the Graduate hotel, a property that we had visited years ago. It has changed names since. 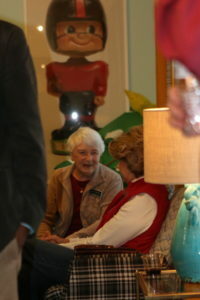 The Holiday Party was nicely done and a big thanks go to Stacey Schepens who was our lovely host. She had the traditional hospitality suite set up and it was a happening place Friday and Saturday evening, and again after the Saturday formalities. The hospitality suite seems to be a MOGSouth necessity, a signature of our events. It is different things to different people, and has changed over time, but it remains the ‘go to’ spot at a MOGSouth event. Most notable this year was the football game on the big TV. The conference championship game between Georgian and Auburn. And, for those of you that haven’t heard, Georgia won. The evening’s festivities were held in private banquet room at the hotel and everything was well organized and the meal was lovely. They even had options for those with dietary restrictions. It turned out that the only Georgia graduates in our group were Jim and Colette Clark. And, Jim had the headphones on during the dinner to make sure we didn’t miss a significant moment. A few minutes of remarks and then the Mother Courage Award ceremony. This year was a bit of a challenge for MOGSouth. Lots of Good Times and some not so Good. The Good Times . . . 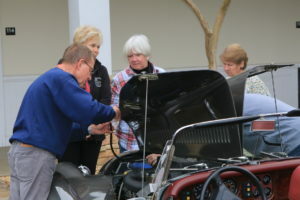 In March we had the MOGSouth Noggin at Cars in Coffee in Amelia and it was a huge success with nearly 50 attendees at the Friday Night MOGSouth Noggin and then there was the actual Cars and Coffee event on the golf course on Saturday. In May we held the first ever US based Morgan Three Wheeler Convention in May in Augusta and; although it was not really a MOGSouth event, it felt like one with all the MOGSouth participation. The Not So Good Times . . . It seems time caught up with us this year and that in itself has been a challenge. 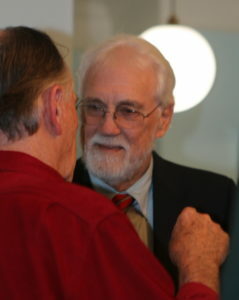 We lost a few amazing members with Norris Haynes and Graeme Addie. They were more than just members, they were friends and they were family. Jenny Addie attended the Holiday Party and it was wonderful to see her. And, of course the dogs were in the van. Some other MOGSouth members are dealing with life changing events and couldn’t be with us, but they too are family and always welcome. As is the norm for the MOGSouth Holiday Party, we presented the 2017 Mother Courage Award. The Mother Courage Award is our only perpetual award and is given in honor of Dan and Nancilee Kelly. This year’s award went to the aforementioned Jim and Colette Clark. Well deserved!! Eventually, the masses scattered into the night. Early departures were in the plan. Everyone has lots to do this time of year. Another wonderful MOGSouth Holiday party!! Again, thanks to all who made this year a memorable one for MOGSouth. Now let’s see what we can do with 2018!! The gloves are off, according to Morgan. 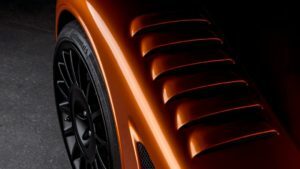 The cottage industry car maker has just dropped its first teaser of a new, ‘race-inspired’ sports car – the Aero GT. Thankfully though, these shadowy images of a front wheelarch aren’t the only information we have to go on. Power will come from a BMW-derived 4.8-litre V8, with 367bhp-worth of shove being sent through a six-speed manual gearbox. A 0-62mph launch time of 4.5 seconds is possible, as is a top speed of 170mph. The Aero GT marks the end of the Morgan Aero 8’s 17-year-long production cycle at Morgan’s Pickersleigh Road production site. Every panel of the bodywork has been hand-shaped by Morgan’s metal workers, and features new wing top louvres and a ‘drastic’ rear diffuser. The new British sports car will be officially unveiled at the 2018 Geneva motor show, so set a reminder for early March 2018.